Blue Velvet is new and lovely, and is now a proud member of prohomesja's Caribbean Luster line of homes. This arty beautiful studio nicknamed “Blue Velvet” is the perfect vacation rental apartment for a uniquely unconventional, truly Jamaican living experience. This Kingston, Jamaican vacation rental, the epitome of chic and comfort, has been decorated with comfort in mind. This gated community is guarded 24/7 by professional security guards. This vacation condo is located only one minute drive from New Kingston, Kingston Jamaica’s business and entertainment district. SIMPLE RESERVATIONS We’ve designed our online booking to be as simple as booking a hotel room—except you get an entire, amazing home. Need help finding the perfect place? Just call. We’re here if you need us. SERVICE Inspired. Dedicated. And committed to providing you with the Best. Vacation. Ever. It’s part of our peace of mind promise. So just like a hotel’s front desk, we offer guest services throughout the course of your stay. We’ve built a team of hospitality professionals; so should you have any questions, thoughts, or concerns during your vacation, rest assured we’ll have an answer or solution right away. HANDPICKED HOMES Every vacation you take is special. And we believe the home you stay in should be, too. Each and every home is exclusively hand picked and meets our meticulous standards. Also included is our Island pockets for those budgets travelers looking for a sweet deal. That’s why whether you’re looking for a sprawling estate or that quaint rustic cottage, you can be confident each is of the highest quality to meet your high expectations. And we certainly have no problem showcasing all the details of each home with high definition photography, accurate descriptions, and even all the little touches that make it such a unique place to stay. The vacation rental is located on the ground floor. 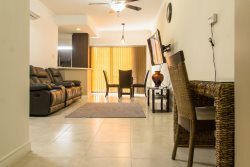 In this bright and charming vacation rental apartment which is located right near the heart of Kingston city, you can explore a unique and luxurious Jamaica vacation rental experience and more... Ideal for the business traveler or the hard working professional who just want to take a vacation to relax in a modern studio which is in immaculate condition and makes for a very comfortable stay. The open-concept layout vacation rental boasts high quality porcelain finishes and blue concept décor all throughout. Through the entryway, guests will find the blue décor inspired living area, complete with a contemporary-styled futon sofa, as well as a TV with cable and wireless internet throughout. The kitchen comes fully equipped with a refrigerator, microwave, electric stove, all utensils, cookware, solid surface countertops and cupboards and a romantic bar area with stools that seats two persons comfortably. The opposite side of the kitchen area also houses the apartment’s washer/dryer. Jamaica will afford you the luxury of a boutique hotel with the unique local experience of an apartment rental. This is comfort in a relaxed and fabulous way. Those of you who are ready for this unique experience will have a wonderful stay at “Blue Velvet”. Guaranteed. This vacation rental complex was built in 2015. The spectacular secure gated complex called “Eight” comprises of thirty-one (31) studios and one-bedroom apartments that resonates with the Georgian architectural style of Devon House. It has lush green area all around. Centrally located in the heart of Kingston, Jamaica. Eight is close to everything to suit your cosmopolitan lifestyle or vacation needs. This brand new complex has 24-hour manned security, security checkpoint upon entry at the gate, all the modern amenities including covered portico entrance, and on site generator for all units. There is ample parking for you and visitors all around the complex. This beautiful one bedroom Kingston, Jamaica studio is located in a brand new secured, residential development situated along Kingsway Road within walking distance from Kingston’s major retail hub, Half Way Tree and Jamaica’s business district, New Kingston. That’s not all! You will be just a stone’s throw away from the world renowned Devon House Heritage Site which is one of Jamaica’s leading and most popular national monuments and symbol of the cultural diversity that makes this island a unique and preferred choice for vacations. Devon House features 11-acres of lush sprawling lawns and offers an enviable shopping experience, especially, the most sought after, Devon House Ice Cream. If you enjoy shopping, you’ re in luck because Mega Mart, one of the country’s largest supermarkets and department store, is located only 5-minutes drive away from the vacation rental. Right beside Mega Mart, you will find a business and entertainment center that features various businesses and night clubs such as Peppers. For all you Canadian nationals, you will love the fact that the Canadian Embassy is only walking distance from your complex. Just 2-minutes drive from the complex you will also find the Andrews Memorial Hospital which is a privately owned hospital that features a Dental Centre, Intensive Care Unit, Imaging Unit, Maternity Unit, Operating Theatre, Pharmacy, In-Patient (private rooms), Outpatient Department, US Medical, and a Vegetarian Café. So you have access to good health care while in the island. business travelers and for those adventurous island hoppers. Banking, shopping, petrol stations and other domestic requirements are located within walking distance at both Half Way Tree and New Kingston. The area benefits from the provision of the full range of urban services such as paved roads, street lighting, cable television, garbage collection, mail delivery, telephone, Internet, cable TV, domestic water, electricity supply, hospitals, medical centres, police and fire protection. Public transportation passes nearby the property along Hope Road in Kingston, Jamaica. I was in contact with Karen and audrey, before my trip, during my trip and at the end. They were very responsive and worked with me on my last minute date change. Each time we spoke the interaction was seamless and the exchange friendly. This is my second stay, I will always book with them when I travel to Jamaica. The property was very clean, and nice. All appliances was in working order, the hot water in the shower however was on and off, as well as the pressure. Other than that everything else was wonderful. Kesashia is my contact person and like always shes always done a fantastic job,never fail to satisfy, very friendly security team and mentainace staff. GREAT GREAT AND GREAT WILL BE BACK, professionally run, 100% satisfaction. You're in for a treat as this one bedroom vacation condo is managed by prohomesja, so book this fabulous vacation home and be assured that you booked your holiday with someone that takes your enjoyment as seriously as you do. Please note that check in is at 4:00pm and checkout is at 11:00am. If for any reason you are unable to make these times then please contact us to make alternative arrangements. Gated Community located a stone throw away from the world famous Devon House. With 24 Hour security and location perfect, the Ei8ht has become one of the most popular spots in Kingston.